"Here, in the dread tribunal of last resort, valor contended against valor. Here brave men struggled and died for the right as God gave them to see the right." It's amazing to think about what came out of Victory Games in 1983. This small company full of talent managed to release no less than three games that would still be remembered as classics more than thirty years down the road. NATO: The Next War in Europe and Gulf Strike are fondly talked about even these days but the one game that many gamers speak of in tones of reverence is Eric Lee Smith's The Civil War. This game was so ambitious in terms of scope and historical accuracy that it is still hard to find anything that matches up to it. I haven't played any Civil War games before and I admittedly don't know much about the conflict itself. Wanting to learn more about the appeal of this era, I cleared my late evening schedule for the next month or so and put this game on the table late last week. Last night, I started lumbering through the first turn, flipping through the rulebook and trying to make sense of it all. Here are my impressions so far. 1. The North starts off in far more trouble than I ever anticipated. There is a considerable Confederate force near Washington and the rail lines through West Virginia have been cut. The Union is going to need to clean up this mess before it can really start to make any serious headway down south. On the other hand, if the Union uses up all its energy on pushing back the Confederates, that would give them time to consolidate their hold in the West and Trans-Mississippi. 2. Wow, the North has some really bad leaders to start off with. Butler is a disaster waiting to happen. Hopefully the Union player will win Initiative enough so that it can pick better Leaders at no cost and place them. Unfortunately, on the very first turn Pulse of turn one, I managed to pick Buell, who could only lead a Union army to sure defeat. Reluctantly, I placed him in St. Louis with 1SP. 3. The Confederate Army is well-led but does not appear to have enough men to do the job. The push near Washington is a deadly gamble but it's near certain that the Union will defeat it eventually. Although there are some very competent officers in the West, it seems that border states like Kentucky and Missouri will inevitably fall to the Union in the early game. Is it better to put all my reinforcements in the East and hope to take Washington early or let that offensive fail and use my reinforcements elsewhere? 4. Naval power seems to be the key to the Union winning the game but how best to use it? No doubt, the Union can land men anywhere along the southern coast of the US and wreak havoc behind enemy lines if led by a competent leader. On the other hand, using river transport and ironclads to take over the Mississippi and thereby cut the Confederacy into two separate nations would severely hamper the South's economic and military capabilities. It seems that the Union has enough naval and manpower to do well with one of these strategies but not both. 5. There is so much to do and so little time to get it all done. The Command Point system forces you to really think about and prioritize what you want to accomplish in a single turn. Since the turn may end at any time, this means that you might not have the time to play it safe and slowly work your plans through to completion. During the first turn and I could keenly feel the pressure to make a breakthrough here or there, going through with risky attacks in order to just find some kind of opening or weakness. I certainly feel that the Union should be succeeding but it keeps getting hamstrung by poor leadership. Although I am just at the very start of my current campaign, I already have a sense of why people like this game. The rules are very clear and they make sense. The breadth of the game attempts to deal with as many relevant historical factors as possible without getting weighted down in unnecessary historical detail. I love the game's approach to the different theaters of war. The action in each theater of the game has its own unique tempo set by geography, military importance, and supply challenges as well as the players' local and overall objectives. Glancing at the map, you can almost envision the epic grandeur of the war. You will make fruitless cavalry charges in the mountains and hills of Virginia. Your generals will vie for glory in the corn fields of Kentucky. Indian tribes will skirmish on the dusty lonesome Texas plain. As the Union leader, you will constantly fight against time while as the Confederate leader, you will contend with a near-constant lack of supplies. Really, what is there NOT to love about this game? Nicely written, I look forward to your next post. Thank you for your comments and for designing this excellent game. It's an honor. I'll just echo Brad here to thank you for one of the most remarkable designs I've ever played. 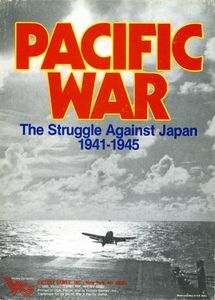 If it had merely been republished with larger fonts (for my older eyes) and maybe a few clarifications, it would be a big seller now as it was at that time, a title by which ALL other strategic/grand strategic ACW games get judged! I was teaching a friend of mine the series and I started with the 1862 scenario. With little background in the ACW, as the Confederates, he near replicated the SHILOH campaign/battle! That's high marks in my book for a simulation/game. THere's much there in what is a surprisingly small set of rules. Also of note and fabulous in action were the pioneering Historical Background for various rules BY the rules! My friends and I had hours and hours of fun playing the game....and I had many, many hours researching things I didn't know before owning it. Especially of the Union Commanders, I read up on Steele, Ord, Logan, and many others to find out who these guys really were! The impact of the Union Naval Power, though elaborated in a tactical level in wargames like the wonderful IRONCLADS, can best be seen in TCW as the Union dominates the rivers and oceans. Getting a 'visual' of how far into the Confederacy many of the rivers were navigable made the importance of the fortifications more apparent. Ah, well, anyway, thank you for a design that has given my friends and I, past and present, such very great competitive pleasure. Excellent game that has gotten a revision last year by GMT. I won both and will always treasure them. Thanks for commenting, Jason! 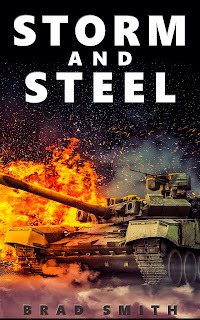 How do the two games compare in your book? That 'new one' has been officially called 'Not A Revision'. They've taken many things crucial to TCW...and ruined them. It's ridiculous to be able to plan on an opponent's leader leaving the game! I can see 'promoting them off the map' (which you can see was probably Halleck's Fate) ...but just knowing they'll die/leave? Also, the telescoping....and then suddenly ending turns, with the built-in additional VPs for the Confederacy for the 'extra action' the Union maybe could achieve...was brilliant and made you really think: "What MUST really happen FIRST....if I had one CP...or I had two CPs....or...."
That 'other title' turned out to NOT be a revision of the VG 'The Civil War'. Maybe it started that way, but it is not so on publication. There are too many changes to essential features to have that one considered a revision of VG's Classic. I haven't gotten much into the new one yet. It is a big game and I can be a bit slow. It is on my to do list. Right now I'm on the CoH solo expansion. Have you tried it? Not yet but I want to! 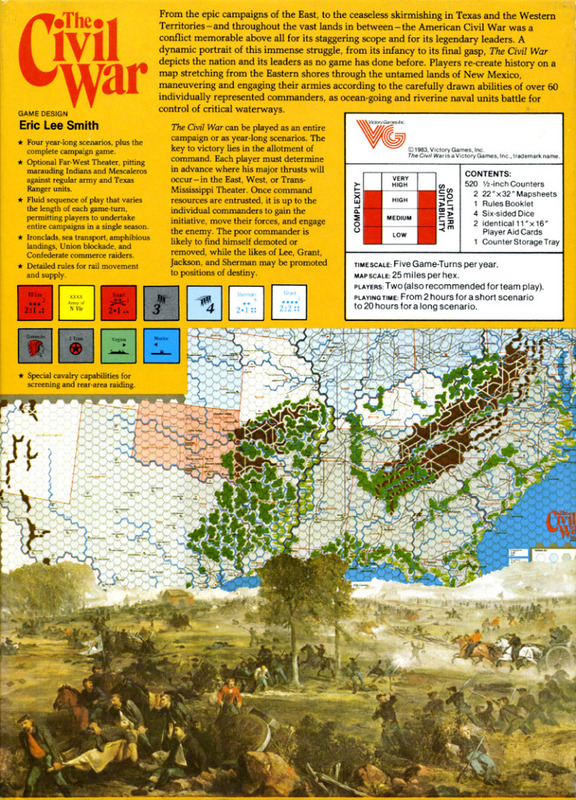 -----  Victory Games Eric Lee Smith's Civil War is absolutely one of the top 5 or 10 simulation board wargames ever published. -----  The Wargame Academy 3rd Edition rules for VG CW are an absolute necessity in order to be able to read the rules & be able to understand the rule & play the game. -----  Remember, I love VG CW. However, the original VG CW rules were anywhere from badly to abysmally badly written rules. The original VG CW rules' syntax, order, coherence, & completeness were sorely lacking. The WGA 3Ed Rules are required. Sorry, but what I set forth here is factual. -----  After 30 years since the last time that I played VG CW, I picked it up again. I am now one of the more versed people on earth regarding this wonderful game. Blather to me as you wish. Thanks Ray! I will check out those 3rd edition rules. I'm hoping to get it back on the table once I can give it the time it deserves. 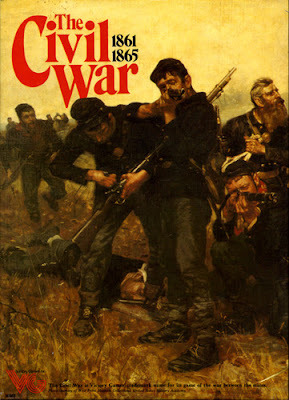 Additional comments on GMT US Civil War & VG Civil War. -----  I have played both the GMT USCW & the Victory Games Civil War. -----  The GMT USCW is indeed a quite fine game, which contains 30 plus years of wargame technology & experience since VG CW was published. -----  Also, VG CW has abysmally badly written original rules. This original rules problem has be largely corrected by the most excellent WarGame Academy 3rd Edition Rules to VG CW. -----  Despite these facts, Victory Games Civil War is still a better game & a better simulation than the GMT US Civil War. I also enjoy this game. I'd like to see it ported to a Napoleonic setting, say on the scale of W&P.